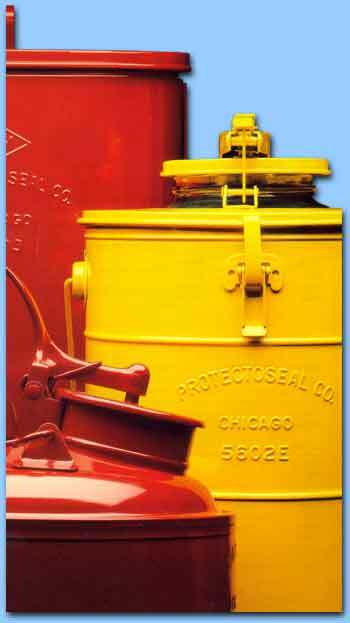 Protectoseal Safety Cans are synonymous with safe flammables handling. And we offer the widest variety of sizes and types available anywhere, including Eagle's Complete Line! The industry's strongest, laboratory-tested, performance-proven, perforated metal flash arresters. Vapor-tight connection to prevent flame from bypasing the perforated metal flash arrester. Spring-operated, self-closing cap mounted on a ball and socket joint that uniformly seals spout opening. Leak-resistant gaskets to withstand the deteriorating effects of most flammable liquids. Safety pressure relief assembly in spout cap that allows expanding vapors to escape automatically. The spring-loaded cap closes upon release of internal pressures. Positive locking connection in spout to prevent unauthorized removal. Special rounded carrying handles to protect dispensing mechanism while providing ease and comfort. Durable, electrically welded, leak-proof construction, lap-jointed at all seams. Wide, 80-degrees opening spout cap for maximum rate filing and dispensing. Quick-acting, one-handed dispensing mechanism eliminates time-wasting engagement and disengagement. The heaviest gauge terne plate (Lead-coated carbon steel) in the industry. Protective "shock rim" around base of can. Rugged, mechanically jointed spout "clinched" and soldered to withstand stain of repeated opening and closing of cap. High-gloss, solvent resistant, baked-on red enamel finish. (Electro-polished stainless steel and other metals also available.